This week we're looking at part two of Practical Magic (Kindle) by Nikki Van De Car. Instead of a traditional review I thought I would take the next few weeks to go into each of the chapters with you at my first read as opposed to reading the entire book and then giving a review. You can find several of her publications at Running Press. Part two of the book is called Magic for the Weekend Wiccan. Again the author takes us to a lighthearted look at magic and paganism. Here I could see where some more dedicated practitioners might be offended by this approach. Good information is often loss because no one looks past the title. I encourage my readers to bypass the possible uneasiness of the section header and check out the actual meat of the book. 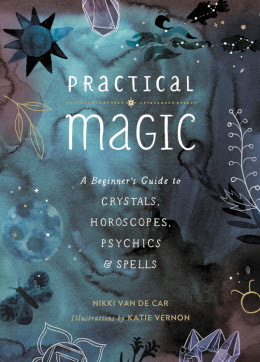 While not necessary for an advanced witch I can see how this may be used as an introduction into the magical world. Remember not every Witch practices Wicca. The weekend chapters offer a brief (limited) view of herbs. We all know there are entire books dedicated to herbs so to expect this book to be a main resource would be misleading. There is a part on making tinctures, oils and poultices however I would again use this as only an introduction. Our next section is on plant based magic. There are two pages of listed plants and in does point out that you should avoid belladonna. This is an extremely good idea. As this is a beginner book I would be surprised to see any other reference to it here. Frankly too many people do not take the warnings of herbalist seriously and end up getting sick. Herbs are nothing to muck around with and shouldn't be something that a beginner starts with. Interest in herbalism is a process. I recommend beginning with YouTube and find some great teachers to follow. Next the author reviews the Wheel of the Year. These are are the holidays that are celebrated by many of the Pagan people. Not everyone celebrates these holidays but most have some sort of festival/ritual honoring the lunar and solar cycles. The author provides a brief history of each of the days including ways to celebrate and other correspondences such as the herb, color and stones for each. Then the author nipped that in the bud in the very first sentence. I was glad to see that. She boldly stated the fact, Magic is magic. It has no color. YES! Thank you, Nikki! She goes on to break down, albeit briefly, the types of spells out there and even provides a simple spell for beginners to follow. I was pleased to see how she handled this section. It could have truly been a train wreck. Next week I'll review Section 3 on Causal Clairvoyance and then wrap up this review. Remember you can grab your copy by clicking the links above and I will be compiling a giveaway from all the comments on this blog series and I'll do a giveaway with this book, the matching kit and another book called Feng Crochet all by the same author. Disclaimer: I do not practice Wicca. I am not an expert on any of the traditions of Wicca. I am giving this information as a review of a book written by Nikki Van De Car. Feel free to message the page with questions, however do remember that I am a witch. Without a deity and without an specific tradition.